By default, all commands executed by Bash on the command line are stored in history buffer or recorded in a file called ~/.bash_history. 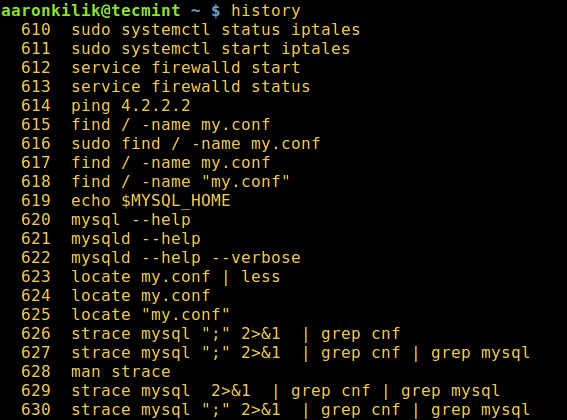 This means that a system administrator can view a list of commands executed by users on the system or a user can view his/her command history using the history command like so. 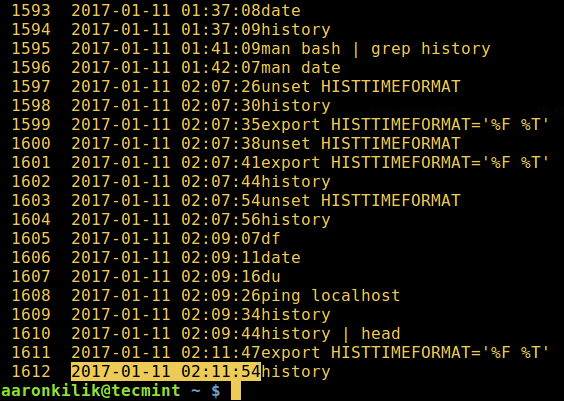 From the output of the history command above, the date and time when a command was executed is not shown. This is the default setting on most if not all Linux distributions. In this article, we will explain how you can configure time stamp information when each command in the Bash history was executed to be displayed. The date and time associated with each history entry can be written to the history file, marked with the history comment character by setting the HISTTIMEFORMAT variable. There are two possible ways of doing this: one does it temporarily while the other makes it permanent. %F – expands to full date same, as %Y-%m-%d (year-month-date). %T – expands to time; same as %H:%M:%S (hour:minute:seconds).